The time is the not-too distant future in a post-apocalyptic Australia. Nuclear weapons haven’t destroyed the world this time around, it’s good old fashioned warfare that torched the nations’ stockpiles of crude oil. Without fuels, civilization crumbles into decay. You play as Max, a nomad in the Australian outback, stuck wandering the wastes where patched-together vehicles and their drivers clash over tanks of fuel. It’s an interesting premise for a game, but a delivery that ultimately falls short. The Mad Max trilogy offered a fresh perspective on the fall of civilization, and would shape the visuals and ideas behind similar apocalyptic games in the desert: Wasteland and Fallout. The movie focuses not so much on the destruction of a population (Terminator or anything with nukes) as the elimination of a key resource (petroleum). The idea being that without this fuel we’ve all taken for granted, civilization won’t know what to do with itself. This plays out as a common theme throughout the movies. For example, gas is rare but everyone has a vehicle of some sort. Everyone including and surrounding Max is so far deep into the outback that they could not possible carry enough fuel to escape, so they live a day to day existence; driving around, killing, taking what fuel they can. Why bring all this up? It’s because, as it should be, the paradox of needing petrol to find more petrol is a thorn in your side throughout the entire game. Mad Max never swears allegiance to just one of the films, but it does split your gameplay into two distinct sections. The first has you traversing the wastelands and has most in common with The Road Warrior. The second has you battling it out in a demolition derby arena, and has most in common with Beyond Thunderdome. In the “Road Warrior” section, you drive the turbocharged police interceptor from the end of the first film. Your main purpose is to locate and raid hidden shelters for food and water, so you then can barter these supplies at a roadside shop for an arena pass, which is your ticket to the next level. 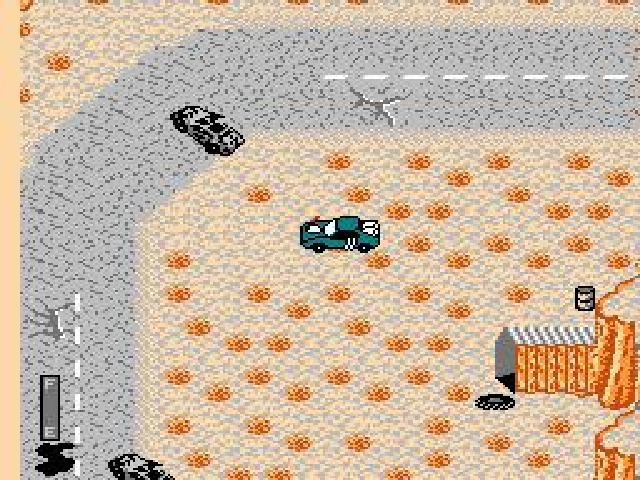 During this process you are assaulted by guard towers tossing explosives, and other vehicles attempting to ram you. To deal with the latter threat, you have a limited supply of dynamite to lob out of the window at your aggressors. Your best best with the former is to just avoid them altogether. However, you are timed by your meager reserves of fuel. You start out with a half tank and then are forced to watch as it blows through your vehicle faster than a bad burrito blows through you. In a matter of minutes after starting, you will have run dry. This can get quite annoying since you have no clues about where to go, no map to assist you, and essentially must putter around the desert until you spot the entrance to a shelter. It’s very heavy trial-and-error, for which the game is not forgiving. Expect to reenter level passwords, or reload saved states often during this search. Control in this area works well. It will take some adjustment as you have no real accelerate button, you just drive in the direction you hold down. 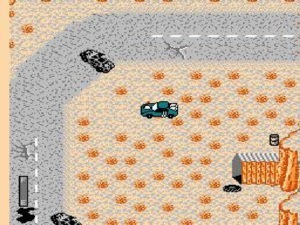 The graphics also portray the wastes well, with desert land, overturned cars, and other such junk. There’s no music, but a solid engine sound as you drive. Crashing into things plays one of two effects, glass breaking, or a bucket of nails falling meant to be metal colliding. They still sound believable, and sound overall would have to be Max’s best asset. Once you successfully locate a shelter, it’s up to you to move around it in a near 3/4 perspective, blasting mutants and grabbing gear. 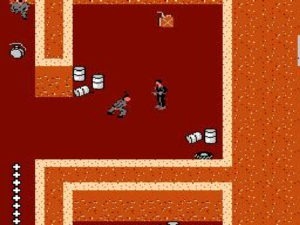 Your primary goal is collecting enough food and water to buy your way into the mysterious arena, but you can also snag ammunition for your mutant-blasting rifle, dynamite, and if you’re lucky, a can of “the juice.” Mutants shamble around in the meantime and try to tag you, which apparently causes damage. Keys are also placed around the area that go to locked doors that hide small caches of goodies. Basically these keys just exist to keep you in the shelter a bit longer and force you to hunt around. Once you have enough to trade then it’s time to hit the road and make it to the shop before you run out of fuel. Buy the pass, spend the rest on fuel, then drive back through the desert in search of the arena entrance. If you haven’t picked up on this yet, there is a lot of driving and searching in this section, and a whole lot of running out of gas. Card in possession, you enter the “Beyond Thunderdome” section of the game which sets you in the middle of a giant car battle set in an arena. You’re stripped of your dynamite, so the intent here is to drive around the arena’s very narrow paths and knock cars off and into the pits below, or trap them in the holes which randomly open and close in the arena floor. Once again your fuel is rapidly burning out, and your car takes damage from every collision that can add up to destroy it. The odds are further stacked against you with the fact that you only have the continues you didn’t use from the “Road Warrior” section, and if you run out then you must start over at the beginning, shelters, pass card buying, and all. 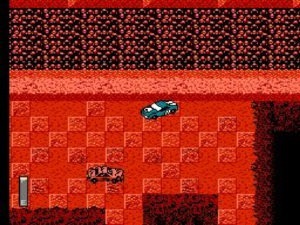 If you do destroy all of the cars, you are left to use whatever fuel you have left to drive around the arena, avoiding its hazards and making your way through its unmapped maze of pathways to the exit. I need not tell you that this is quite frustrating as you are doing what is really the same hunt-for-the-shelter trick from the first section, but now with demolishing hazards every few feet. Graphics here are a slight letdown compared to the wastes. There’s not much detail at all, just a lot of paths that all look the same. Sound is exactly as with the previous level, except the car crashing noises are obviously much more common, and there still are only two of them. If you succeed, you are presented with a password and then set out to repeat your actions on a new level. These “Road War 2 and Arena 2” levels are laid out differently and palette-swapped, but still the same old schlock. Win both and you get a password and the chance to do it again a third time. Yet at the end of the third arena, you will fight the gang leader from The Road Warrior (the Jason Vorhees knockoff guy) in a final battle to the death. This is clearly not a battle you are meant to win, as your gun does meager amounts of damage to him, while his gun eats away quite readily at your health. If you die, which you will, you’ll have to start over again from the beginning of the third arena. Mad Max has some good ideas, but fails in the execution. Though the Road War and Arena levels are interesting for ONE level, playing through them again and again is not. By the final battle, you just don’t care anymore, and the odds are so heavily stacked against you that it almost doesn’t make it worth completing. Mad Max is a decent show for a few short periods, and there are times in the Arena when you’re battling precariously close to a ledge, or in the Road War where you’re almost to your objective and running on vapors, where the game can be relatively intense. But it is unlikely that you will find much enjoyment for very long.